The Italian dishes of my youth were loaded with high-fat, high-salt cheeses. So much for my Mediterranean diet since my angioplasty in 2012. I’ve been redoing Italian recipes in recent years to get out the fat and salt in most cheeses. My eggplant parmesan recipe calls for low-salt panko breadcrumbs to bread slices of eggplant which have been coated in an egg-white wash.
Add more tomato sauce if you like. Use a salt-free tomato sauce (I make my own but you can buy prepared ones like the Trader Joe’s variety I reviewed here). Next add fat-free shredded mozzarella. 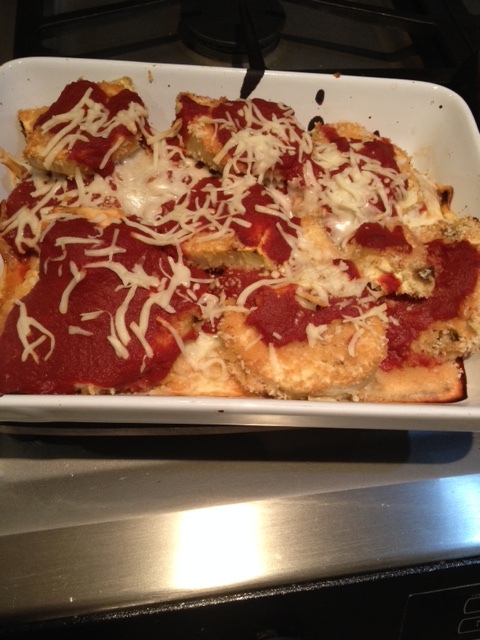 I build mine like a lasagna, putting tomato sauce in the bottom of an oven-safe baking dish first, then a layer of eggplant slices, then more tomato sauce, then more eggplant until the top layer of sauce and then mozzarella. If you’re less worried about the salt in the cheese than I am, add more as layers while you built. Bake for about 30 minutes, or to your taste. I take the skin off the eggplant since I find it hard to chew, but some people leave it on for the color it gives the dish.